In Boston for Inbound13 and looking for ???? No one ever said what happens in Boston stays in Boston. In fact with thousands of inbound marketers wandering the streets of Beantown hyper-kinetically tweeting you'd better mind your "Ps & Qs"! That's why at Consilium we're emphatically not looking for hookups - figuratively or literally! Too many folks jump on the inbound marketing bandwagon expecting rapid success. You know better. Who's got time for the emotionally draining crap that results. But we do know what makes us unique and potentially attractive, and we also know what we seek in a (business!) mate. If you're an inbound marketer you know the ropes, and you know your industry. If your an agency, you certainly know the ins & outs of inbound marketing, and you know your clients pretty well too. You don't need more of the same. But at Consilium we've got some qualities that may perfectly compliment what you know and do well. We can help you stop simply wasting 50% of the awesome inbound leads that you generate. Similarly every long-term relationship is built on common aspirations. No, we're not looking to get children launched off into college and life, but we are looking for a few companies that are interested in working together to build their sales globally. If you're only goal with inbound marketing is to generate traffic, or to sell some local service in your major metro area, we're not a good fit. But if you market in pursuit of profitable, long-term, diversified business growth, well then....maybe we should have a 5 minute blind business date at #Inbound13 to meet and plan a time to speak about mutual opportunities. Want to learn more? 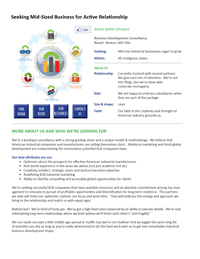 Check out our global business development dating profile.